Ultraviolet light (400 nm). The measurement amplifi cation is adapted Photometric measurement principle with highresolution 4-channel optics, automatically to the methods used. Extraneous and scattered light energy is absorbed. tubes such as BD Vaccutainer® or Sarstedt Monovette®. Bi-directional Interface for PC-Link to LIS. Approved and highly accurate detection algorithm based on optical density. The clotting time is defi ned at the turning point of reaction. An intuitive TECO familiar graphical user interface with „Plug and Go” feeling. Random access scheduler. Profi les can be performed as batch or selective. Calculation of activity %, INR, Ratio, g/L, mg/dL and more. 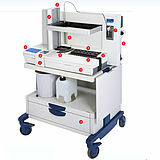 Calibration curve can be identifi ed with up to 6 points per test. The results can be calculated with regression line analysis or linear interpolation. Automatic test skip, if reagent run out. Half volume procedures resulting in 50% cost savings. Very economic consumption of rinse and cleaning solution. 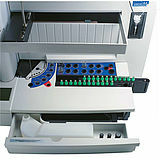 Cuvette with no mixing bars, etc. 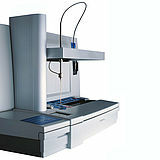 All critical system parameters are monitored and make the instrument nearly free of service.